After meeting at the Astro Boy in front of JR Kyoto Station, we started the tour. In the morning, the bus going to Golden Pavillion from the station is usually very crowded. 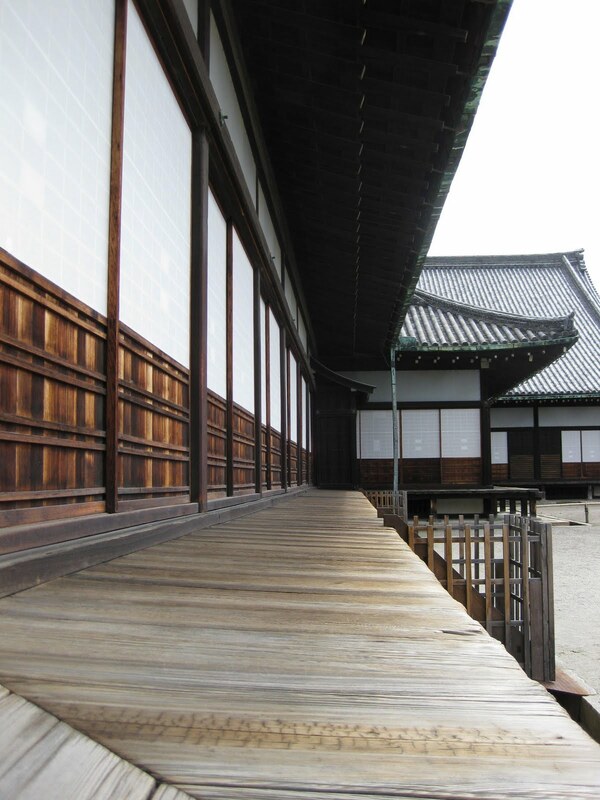 Avoiding being packed by so many commuters, first we headed for Nijo castle. 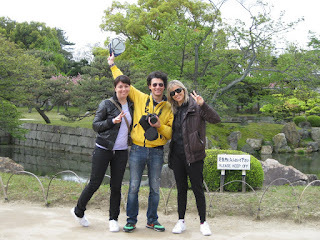 After looking around the inside of the building, Ninomaru, we enjoyed walking in the garden. At that time, some people, including a member of our group, got into under the porch. They were looking above.... I mean they were looking at the underside of the floor. I was wondering what they were looking at. He said that they just wanted to know how the floor squeaks. Now I understand why they did so. But that was the first time I had ever seen someone doing so. 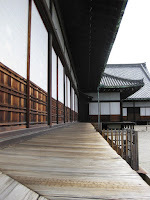 They were interested in so-called nightingale floor. After visiting Golden Pavillion, we went Ryoanji rock garden. It was a beautiful day. Sand in the garden reflected the sunshine and looked whiter. I have been there so many times, but I really felt it beautiful. Later, we took a walk in the precinct. The cherry blossoms were still blooming, They showed us the last beauty. When the breeze touched the blossoms, petals were falling off the tree and fluttering down in the air. It was like a snowfall. The ground had something like pink carpet on. 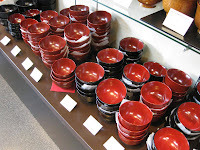 After OKONOMIYAKI lunch, we visited Silver Pavillion. There, we enjoyed some different aspects of the garden. 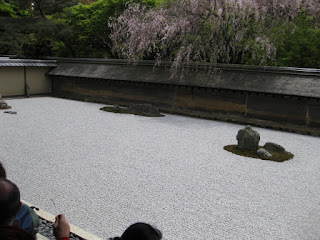 In addition to the Sand garden, when we enter the garden, the small pond came into our sight. When we walked up the hill, we could see the Pavillion down there. It was the same one, but looks a little different. Green moss covered the ground. It was so vivid to my eyes. 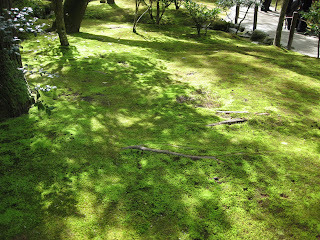 This season shows us so fresh green of the leaves and moss in the garden. On the way to the nearest bus stop, one of us bought a pair of lacquer ware. He explained to me that he would use them for pasta at home. After visiting Nishiki Food Market, I said good-by to them, wondering whether they got something at a 100 yen shop near their accomodation.